Bird houses are man’s humble offering to his winged, feathered friends, and one of the oldest and most important expressions of the love of and compassion for animals. The history of houses built for birds like sparrows, finches and swallows goes back a long way. Some of these tiny dwellings, whose numbers proliferated in parallel with the development of classical Ottoman architecture in the 15th century, indicate that they were being built, albeit on a smaller scale, already in the pre-Ottoman period. The purpose of these charming bird houses, which the Turks continued to build up to the 19th century, is to provide refuge to birds, who range freely through the skies but are consequently lonely to the same degree, and to protect them from harsh weather conditions. There are many different types of bird houses. While the first bird houses tended to be simple, in the 18th century they were transformed into structures of comfort exhibiting a refined aesthetic sense. But aesthetics isn’t everything of course. All bird houses have to meet certain standards, the most important of which is to ensure that birds feel safe inside them. What would be the point, for example, of building a bird house in a place accessible to a cat? Their houses need to be constructed on the sunny side of buildings, in a place that is not exposed to strong winds. One of the most beautiful examples of civilian architecture, bird houses are the centre of attraction on any building. Some have been added following construction, others built in at the start. We encounter them everywhere--on mosques, madrasas, libraries, houses, inns, baths, tombs, bridges, churches, synagogues, and even palaces, in short, in every place that has been touched by human hands. Bird houses fall into two groups. The first group consists of those built specially into the facade of the building in the form of either a single aperture or several side by side, in other words, structures that do not extend far beyond the facade. 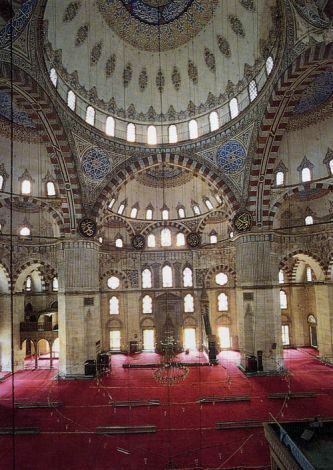 Those on the Suleymaniye Mosque, the New Mosque (Yeni Cami) and Buyukcekmece Bridge in Istanbul are examples of this kind. There are also bird houses that project out from the facade of the building, most of which were built in the 18th century. More than houses, these are highly ornamental, elegant dwellings reminiscent of palaces or pavilions. Indeed, some of them even have feeding and water troughs for finches and sparrows, runways for landing and take-off, and even balconies where the birds can venture out and survey their surroundings. Among the loveliest examples of these houses, which are the product of delicate workmanship, are the Yeni Valide, the Ayazma and Selimiye mosques at Uskudar, and the building in the inner courtyard of the Darphane at Topkapi Palace. Other important buildings with bird houses in Istanbul include: the Feyzullah Efendi and Seyyid Hasan Pasha Madrasas, the tomb of Mustafa III, Cukurcesme Han, and the Ahrida Synagogue in Balat. Bricks, tiles, stone and mortar are the building materials of bird houses. Unfortunately those that were made of wood have not survived. Istanbul is not Turkey’s only landlord catering to birds. From Thrace to Eastern Anatolia, bird houses are to be found in every place touched by human hands. Kirklareli, Tekirdag, Edirne, Bolu, Bursa, Milas, Antalya, Amasya, Kayseri, Ankara, Nevsehir, Sivas, Erzurum, Sanliurfa, Dogubeyazit are just a few of the Turkish cities with bird houses that we can mention here. Bird houses are a symbol of the value and importance Turks place on animals, especially birds. Several foundations were founded in the Ottoman period for the care and protection of animals. Some of these foundations specialized in feeding birds on cold winter days, caring for and treating sick storks, and providing food and water to animals in general. That take wing when children laugh. And happiness will also warm the birds.